Essential oils of Peppermint, Eucalyptus, Lavender and Myrrh contain neuro-depressive qualities for blocking pain as suggested by several studies in recent years. Also unique in their pain-relieving properties are Helichrysum, White Fir, and Douglas Fir. There are several factors in pain sensation resulting from trauma (both physical and emotional), nerve damage, joint dysfunction, arthritis, and surgery. Most of the research has been done in France and has not been translated into English. However, there is substantial documentation to support the safe and effective use of therapeutic grade essential oils for many health related maladies, including pain. Of the many nerve fibers of the human body, the nociceptors comprise a large number and are located primarily within moving joints, and innervate various tissues within the body. There is a protective nature of the sensation of pain to help prevent injury to ourselves, staying within our pain “threshold,” and to signal the brain to compensate for a previous injury. Nature has supplied us with a natural plant aromatic oil that has the ability to suppress substance P, a neurotransmitter that signals pain within the brain. Other essential oils from plants help muscles relax, heal bone, repair tendon, and calm the otherwise stressed sympathetic nervous system that keeps us in the pain-spasm-pain feedback loop with no relief. The primary pain formulas used varies from person to person although the same basic formula keeps repeating. Instructions: Make the formula and place into 00 capsules (00 is the size of the capsules.). Take as often as needed, or three to four hours apart. Instructions: Take internally in an 00 capsule, two capsules at night are good for about five hours of pain relief. Placing essential oil drops into 00 capsules. When plants are selected for essential oils they undergo a stringent process to verify their purity and potency. They are grown in the best of conditions verifying their organic and wild-crafted nature. Many are grown in areas where the soil is extremely rich and have never received chemicals of any kind. They are harvested at their peak to insure that the quality of the oil in their leaves is the highest. Then they are diffused at a temperature that will allow the oils to be extracted into the steam, but not so high a temperature that the healing components are degraded. This is often the case with casual perfume companies who adjust the oils with chemicals to make them appear to be pleasant to the nose, but have no true therapeutic properties. Select few companies have taken it upon themselves to provide pure therapeutic grade essential oils that are potent, organic and contain the highest quality ingredients according to scientific standards set by professional aromatherapy laboratories. The chemistry of essential oils consists of simple hydrocarbons, oxygenated hydrocarbons, and their isomers. The oxygenated compounds of essential oils give them their most satisfying aroma and quality. Monoterpenes and sesquiterpenes fall into the category of Terpenes and contain groups of hydrocarbons responsible for their therapeutic effect in cells. There are an estimated 1,000 different monoterpenes and as many as 3,000 sesquiterpenes found in essential oils. Both Valerian and Helichrysum contain sesquiterpenes: gamma-Curcumene in Helichrysum (helichrysum italicum) and alpha-Farnescene in Valerian (Valeriana officinalis). Sesquiterpenes are a fundamental class of plant compounds containing three isoprene units per molecule and are found in about 50% of all plant oils. Myrrh (Commiphora myrrha) contains 90% sesquiterpenes and is well known for its fixing property. Ketones are composed of a carbonyl group with a hydrocarbon attached. They emit a strong aroma and aid in nerve sedation, as well as promoting healing. Valerian (vetiveria zizanioides) contains a ketone known as alpha-Vetivone. Both Valerian and Vetiver contain small amounts of carboxylic acids. The presence of acids in essential oils is so rare and unusual that many of them are named for their parent plant, valerinic acid and vetiveric acid are found in valerian and vetiver respectively. The acid molecules carry a benzene ring giving them a higher resonance energy giving them electromagnetic frequencies. Valerinic acid when combined with the aldehyde valerianal gives valerian its unpleasant smell. The sedative properties of valerian however comes from the sesquiterpenes present in the oil. It has been used as a tranquilizer in Germany and to treat insomnia. The aldehydes in oils provide an antiviral and anti-inflammatory quality as well as calming effect to the nervous system. Working on the parasympathetic system they reduce blood pressure by dilating blood vessels, and relieve emotional stress. Essential oils being applied topically. 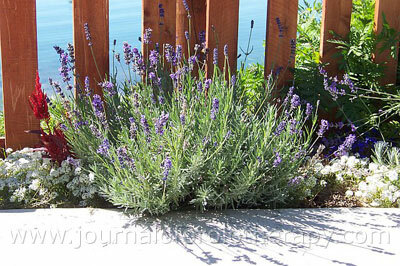 Lavender is one of the more well-known essential oils used in aromatherapy for relaxation. Helichrysum (helichrysum italicum) is also known as Everlasting. It contains less than 0.1% essential oil content and is costly to obtain. It contains the sesquiterpene gamma-Curcumene. Sesquiterpenes delete faulty information by correcting transcriptase function in DNA replication. The largest element found in helichrysum is the ester Neryl Acetate, up to 38%. Esters are known for their relaxing effect, analgesic and strong affinity for acetylcholine receptor sites. This may explain why muscle relaxation occurs as the ester occupies the space of the muscle receptor site and slows down the contraction of muscle fibers. Other well known esters are found in Lavender, Roman Chamomile, Onycha, Cardamom, Jasmine and Spruce. Peppermint (mentha piperita) contains a high concentration of Menthol (34-44%) and is never mistaken for other oils of the mint family. The flavor of peppermint will dominate the blend. It will fight against invading microbes and fight off bacteria and viruses while offering pain relieving qualities. Peppermint will suppress the production of substance-P neurotransmitter in response to pain. It is a popular ingredient to freshen mouth, soothe digestive difficulties, and relieve colic and indigestion. In addition to its effectiveness in pain relief, clove (syzygium aromatica) has also demonstrated itself as an anti-inflammatory and a blood thinner. It has a higher ORAC (Oxygen Radical Absorbance Capacity) value of over 10 million. By comparison the ORAC score of blueberries is only 2,400, 1,260 for spinach, 750 for oranges, and 210 for carrots. Clove has been used as an oral anesthetic by dentists for more than 500 years. The phenolic compounds found in clove clean receptor sites, eat up free radicals and protect us from viruses and harmful bacteria. Clove contains more eugenol (75-80%) than any other essential oil, giving it the anesthetic quality when used topically. Jean Valnet, MD, a French physician, reportedly found clove beneficial for many purposes including nausea, bronchitis, arthritis, acne, halitosis, headaches, insect bites, mouth sores, warts, lymphoma, and prevention of contagious disease. Using therapeutic grade essential oils when there are symptoms of pain or as a protecting agent, and to prevent pain from a medical procedure, has been reported successful and warrants investigation. The scientific data justifies the use of specific oils which have been tested by health practitioners and patients with great success. Whether a person is preparing for Prolotherapy, a simple dental cleaning, or other medical procedure, the use of even a few essential oils may help reduce the pain and inflammation, as well as protect against infection and emotional stress a patient may be experiencing. Young G. Essential Oils Integrative Medical Guide. Essential Science Publishing, April 2003. Second Edition. ISBN 0-943685-34-6. Delaveau P, et al. Neuro-depressive properties of essential oil of lavender. C R Seances Soc Biol Fil. 1989;183(4):342-8. Dolara P, et al. Analgesic effects of myrrh. Nature. 1996 Jan 4;379(6560):29. Gobel H, et al. Effect of peppermint and eucalyptus oil preparations on neurophysiological and experimental algesimetric headache parameters. Cephalalgia. 1994; 14(3):228-34. Higley C, et al. (2001) Reference Guide for Essential Oils, 11th Edition. Abundant Health, Oren Utah. ISBN 0-97-06583-6-2. Manwaring B. Essential Oils Desk Reference. compiled by Essential Science Publishing, Orem, Utah. Third Edition 2006. ISBN 0-943685-39-7. Pharmacological and Toxicological Aspects of Essential Oils. Integrated Aromatic Medicine 2001, proceedings from the International Symposium Grasse, France, March 2-5, 2001. Stewart D. Chemistry of Essential Oils Made Simple, God’s Love Manifest in Molecules. Care Publications, 2006 Second Edition. ISBN 0-934426-99-6.